On Thursday, February 22, the feast of St Peter’s Chair, Bishop Athanasius Schneider will celebrate a Low Mass at the Immaculate Heart of Mary Oratory, at Five Wounds Portuguese National Church, 1375 Santa Clara St., San Jose, California. All are welcome. 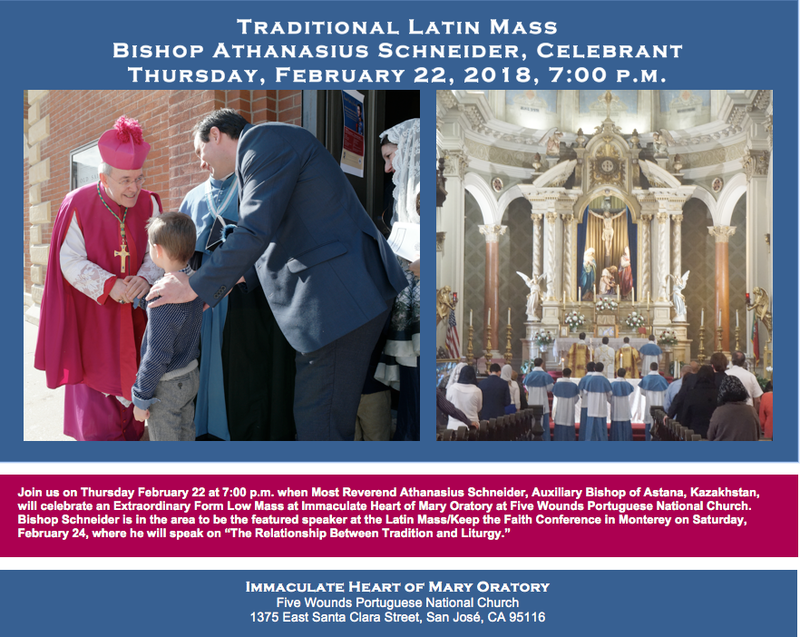 On February 24, Bishop Schneider will be the featured speaker at the Latin Mass Magazine / Keep the Faith conference at the Monterey Tides hotel; the theme of his talk is “The Relationship Between Tradition and Liturgy.” Also speaking will be Fr Joseph Illo, pastor of Star of the Sea parish in San Francisco, California; Father Brian Harrison, O.S., chaplain of St Mary of Victories Chapel in downtown St. Louis, Missouri; Christopher Ferrara, President of the American Catholic Lawyers Association. Additional speical guests are Fr Kenneth Baker, S.J., editor emeritus of the Homiletic and Pastoral Review, and Fr Gerard Saguto, American district superior of the Priestly Fraternity of Saint Peter. For more information, see: https://keepthefaith.org/conferences/.